7 Tricks to making a simple healthy family meal | Awkward; Yet Healthy. Ah, what’s for dinner? The question that strikes fear into the hearts of parents and spouses everywhere. Well, I’m here to offer you some simple meal hacks. 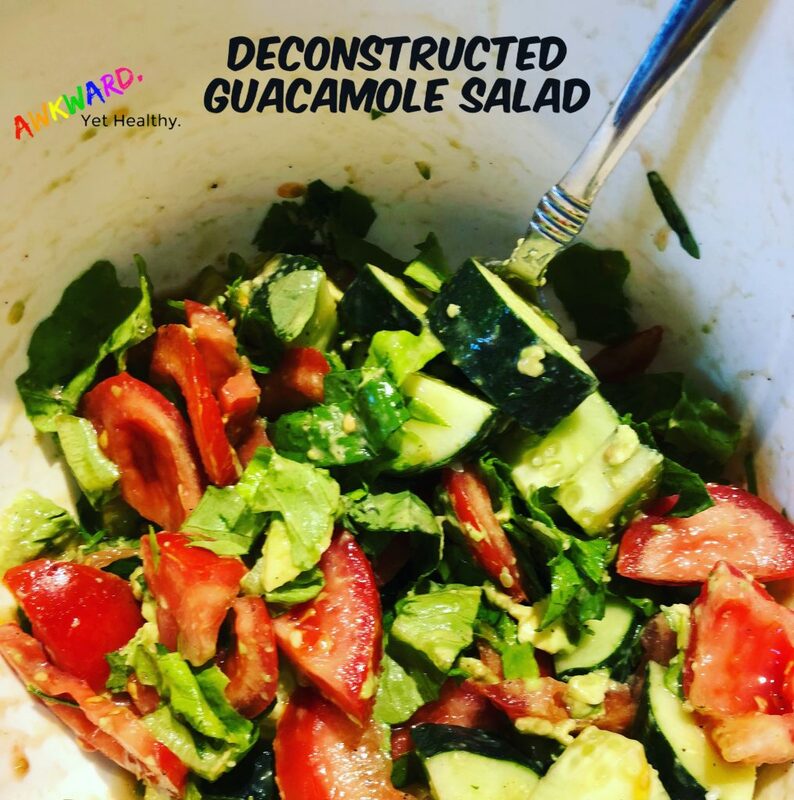 I frequently share recipes and ideas on Instagram, Pinterest, and in my Facebook group, but I wanted to take a few minutes to share HOW I come up with my ideas. Sometimes I follow recipes and use cookbooks, but usually not. I’ll flip through one from time to time for inspiration, but that’s about it. Even still, we have a pretty well-rounded diet, we eat lots of fruits and veggies, and I cook almost every night. I know I sound like one of those ‘It’s easy! follow these 9,736 steps, using these tools you don’t have, and ingredients you can’t find!’ people right now, but I swear this will actually be helpful. There are a few steps I take when creating my mealtime ‘masterpieces’. I’ll break them down. Underwhelming, right? But here’s the beauty in it: freedom. I know what the protein source is, and maybe what a specific side is, but that’s about it. I refuse, REFUSE, to buy one ingredient that I know I will not use for anything else. What’s the point? The thing about eating healthy is that it’s always labeled as ‘expensive’. Which can sadly be true if you’re buying 7 different types of greens every week and only using a snippet of each. Just don’t do it. Buy frozen meat in bulk if you can (I love you, Costco! 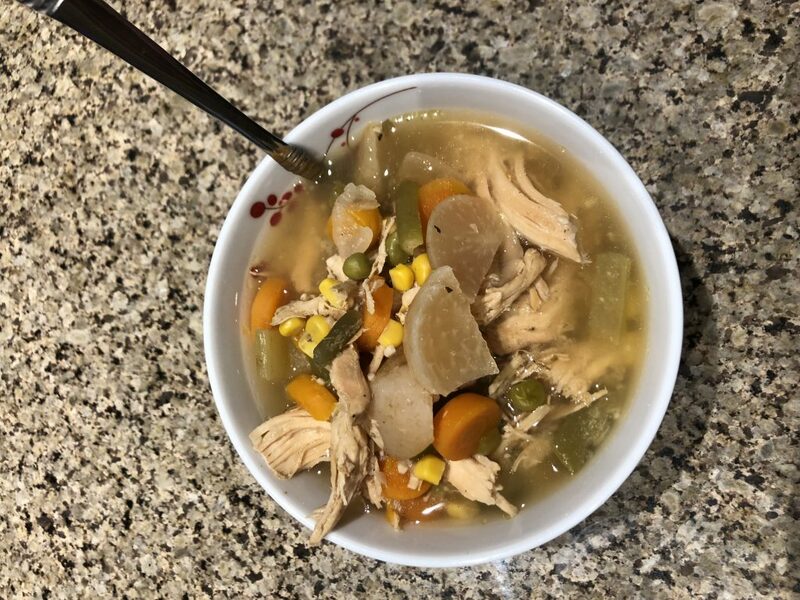 ), also frozen veggies are GREAT to have on hand for last-minute meals, filler for soups, or to throw in anything really. I’m a huge fan of individual guacamole cups too. I freeze them, and then I have avocado whenever I want it! Think of proteins like chicken as a blank piece of paper too. You see how many times it’s in my meal plan? Yeah, we won’t get sick of it because it’s so versatile. 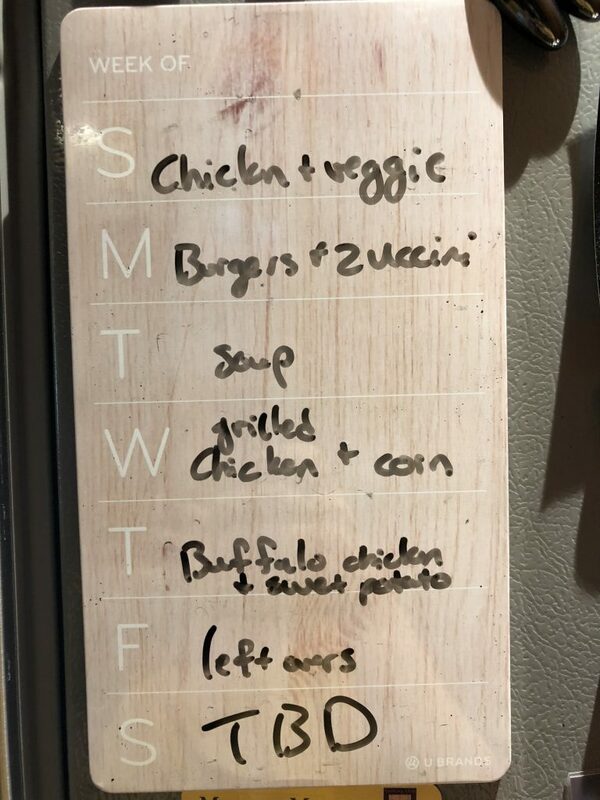 Next week we may not have any chicken at all though, it depends on what I decide to buy in bulk next. Also, things like potatoes, onions, carrots, etc. The stuff that keeps for a while. Buy it up when it’s on sale, store it right, and you can add it to literally ANY meal. Vegetables are so incredibly important, and we ALL need more. Think of them as the base of your meal, after all HALF our plates should be produce at every meal!! One way to do this is to literally serve your protein choice ON TOP of them. This helps break apart the idea of them being ‘just a side‘ and more integral to the meal. Check out this random dish I created. It came from the ‘burgers and zucchini’ option you see above on my meal plan. 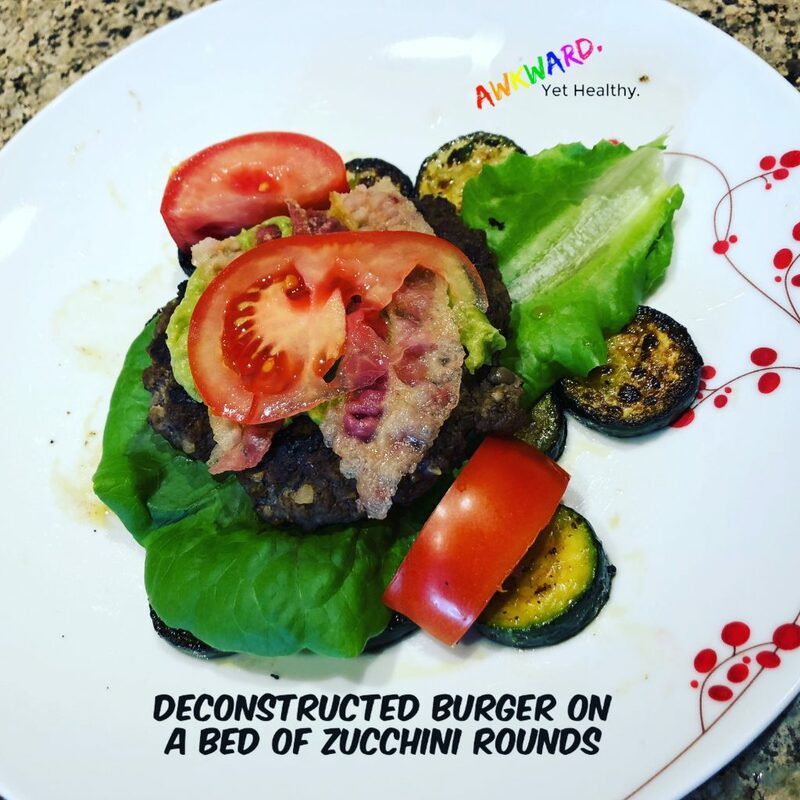 I put our burgers on top of the zucchini, and guess what? Everyone ate it. 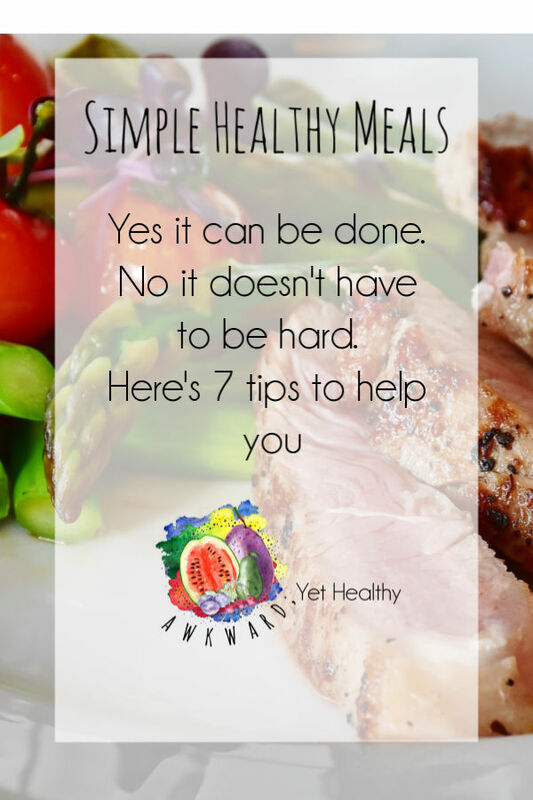 A healthy meal does not have to mean difficult. In fact, I find the simpler the meal, the more my family is willing to eat. For me, the key to a fast, simple, and healthy meal is keeping the methods simple. I have a few trusted kitchen gadgets that I use almost daily. If I have a functioning oven, stove, skillet, knife, baking dish, cookie sheet, and crockpot I can do wonders. Sautee a vegetable and bake a protein, or pan fry a protein and bake a vegetable. Throw it all in one baking dish, or toss it all in a crockpot. You get my drift. I can class it up and make a fancy meal here and there and use all my fancy tools, but for whipping something up on a Wednesday, I stick to the basics. I love how simple a crockpot is. Some things may take extra prep to toss in, but usually, I can just throw whatever random things I have in my fridge in it and then just let it go. At a loss for a dinner one night? Make soup. Take any and all vegetables you have, frozen or fresh, and throw them in. Add a protein if you like. Onions and potatoes (or radishes… no one will even know!) are a great way to round it out. This is one time I’ll always add salt, lots of garlic, and any other spice that seems delicious at the moment. If I have broth, cool. If not, water and seasonings do just fine. Then turn it on and walk away. No reason whatsoever for a complicated recipe. My ONE secret ingredient for almost every crockpot meal? Worcestershire sauce. I don’t know why, but it always goes in there. And I love it. Those are radishes FYI. Not potatoes. Spices and other flavorings can make or break a meal. We adore garlic in our house so I have a giant tub of pre-minced garlic that I add by the spoonful to almost everything. I’m working on growing my own fresh herbs, but for now the dried ones are working great. Onions, chives, chilis, pepper, Italian seasoning blend, Mexican seasoning blend, chili powder, fresh lemon or lime juice, cumin, etc. Any one of those flavored added to a dish can make it completely unique. Ok, confession time: I don’t even own a salt shaker. I will add course seas salt directly to food while cooking if it fits the theme of the meal, but typically we don’t even use any. Sodium is a huge problem in our county, so I avoid adding it to my home cooked meals at all cost. No one in my family misses it either. It’s all about the flavor! To steal a line from a good friend, “You will not die”. Throw things together that seem weird. Don’t measure things, don’t set timers, just do whatever feels right at the moment. Some meals will be flops. I have thrown more than a few in the trash, but more often than not they’re a hit. It’s a running joke that I never make the same thing twice (Unless it’s my mother-in-law’s lasagna) because I don’t truly follow recipes. Every meal is a little bit different. I recreate things often. My chicken cordon bleu, for example, is usually pretty close each time, but it’s never exactly the same. Take my lunch for today for example. Who knows when I’ll put all these things together like this again. So that’s it. It’s a ‘just do it’ kind of thing. You either feel enlightened and empowered right now or annoyed that I didn’t give you easy recipes and a shopping list. The thing is though, you don’t even need those things. You know what you like, what you’re willing to try, and how much time you have. Make vegetables the base and it’s already pretty healthy. Everything after that is up to you and your tastes. If you want to keep up with my crazy food adventures, come hang out in my group! Oh, and for those days that you just can’t get the time to cook, or those days where you don’t get in those fruits and veggies, have no fear. There’s a little thing out there called Juice Plus that can help you be healthy even on those impossible days. For you, your kids, your spouse, everyone. Consider it the ultimate way to avoid the guilt that comes with getting takeout yet again this week. I still want you to cook those healthy meals, but Juice Plus is an easy start.